Wrist strap and dual footwear test station. Up to 1000 different users identified through fingerprint recognition or manual recognition. 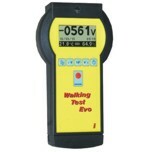 Digital multivoltage, high resistance meter for ESD purposes. Portable measurement system to analyze the "body voltage" of a person. Adjustable power supply (max ±1100V) to charge insulated plates at a desired voltage. 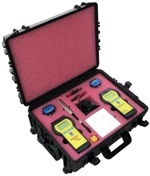 This instrument continuously monitors the integrity of the operator and one ESD worksurface.